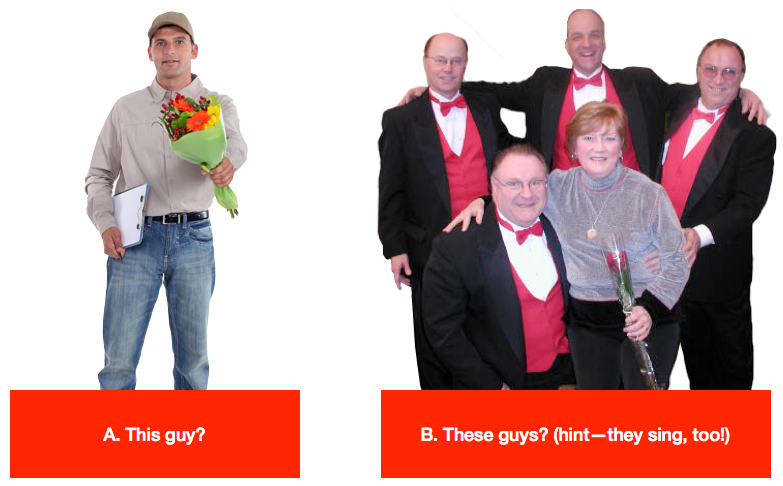 Who would you rather deliver flowers to your sweetie? Send a Singing Quartet with a single rose (or a dozen roses!) anywhere in the Tri-State area: Home, Office, Restaurant… Act now! Availability is limited! Complete the form below. Order online right now (below), or dowload, print, and complete an order form to be sent to the Chordsmen. Is this your spouse? Significant other? Boss? Teacher? Parent? Etc. This is the phone number at the location of delivery, just in case. We STILL will do our best not to spoil the surprise. All of our packages include a quartet, two (2) love songs, and two (2) show tickets for our June 2019 show (a $50 value!). Once you hit "Submit," you will be taken to a PayPal page where you can pay via your PayPal account or most major credit cards.